The Polo Self Help Group (NGO) on Thursday organised cleanliness of river side for health and environment. 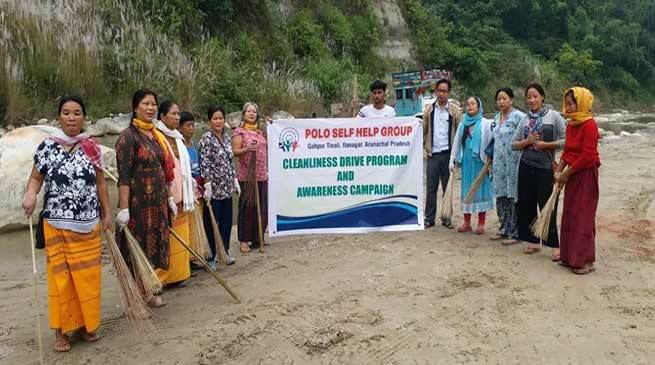 The Polo Self Help Group (NGO) on Thursday organised socials service and conducted awareness programme on cleanliness of river side for health and environment. The NGO with help of volunteers cleaned few portion of the river side of Chimpu river, the garbage, plastic and other unwanted materials were cleared. BJP Mahila Morcha National Executive Member Ken Jump Panama, state Mahila Morcha Secretary Tadar Ami Techi, Vice President Osi Paboh, state Incharge Mahila Morcha Padmeshwari Jamoh, youth leader Taba Loma among others were present on the occasion and interacted with the local people and make awareness to keep river, drain and its source clean for good health and better environment.